Now here is an idea for you: Take the transfer of power between tyrants and turn it into a scruffy comedy. 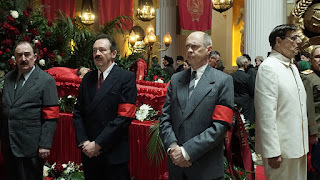 That is the core idea of The Death of Stalin, a dry and pointed satire that somehow never downplays the ruthlessness of the eponymous dictator’s regime. Mind you, it still pokes fun at the absurdity of the system that put Joseph Stalin in place, but the balancing act performed by screenwriters Armando Iannucci (who also directed), David Schneider, and Ian Martin is upon a ridiculously thin wire. It means that, sometimes, the humor is so dry it ceases to resemble humor any longer. Perhaps that is because of the adage that states a joke has its source in truth. In this case, the “truth” would be that, moving past all the horrifying stuff that accompanies it, a dictatorial regime is premised on the absurd notion that one man’s trivial concerns should be the bases of the rule of law. If you don’t find such a notion very funny, say the screenwriters, then perhaps this movie isn’t for you. Indeed, the filmmakers stretch the concept of what is funny for their audience, which, after all, is the function of comedy. In other words, it isn’t as straightforward as eliciting a couple of chuckles. Here, the set-up to the comic premise is already a morbid one: Stalin (Adrian McLoughlin) has suffered a stroke and collapsed in his office. This prompts his inner circle to convene. They include head of the Soviet Union’s secret police Lavrenti Beria (Simon Russell Beale, great as a casual monster who tried very hard to resemble the straight man of this group), head of Moscow’s Soviet Communist Party Nikita Khrushchev (Steve Buscemi), and Georgy Malenkov (Jeffrey Tambor), Stalin’s deputy and assumed successor, should anything happen to the leader. The situation, obviously, is a sticky one. They must find the right doctor, which potentially means calling upon the services of a doctor imprisoned by Stalin for an alleged conspiracy to poison him (The way that Malenkov averts anyone’s gaze upon being asked about the certainty of this conspiracy says quite a bit). They must be cautious about the transfer of power, as the party line commonly regarded Stalin as “irreplaceable” (a shortsighted view, of course). They must be equally careful in handling the affairs of his death upon the arrival of his children (played terrifically by Rupert Friend and Andrea Riseborough). And they must initially do all of this while kneeling in the puddle of urine that the leader’s body produced upon its ischemic event. These are all terrific set-ups to a sharp dissection of tyranny and its actors. Khrushchev jokes about throwing live grenades into the footpaths of prisoners-of-war, then goes home to his wife with a list of what does and doesn’t make Stalin laugh. Malenkov breaks himself into the new position of leader of Russia by emulating his predecessor and insisting upon a lack of any embarrassment that would reflect poorly upon himself. As for Beria, the man may be a monster, but he’s a pathetic loser, too, right when the misplaced loyalty asked of him should be given those to whom he pledged that loyalty. These are brutal fools, sadistic sad-sacks, and cruel clowns at the center of a somber farce. The Death of Stalin ends on a stretch of storytelling that seeks only to reinforce our notions of these terrible men. That seems about right.